The Portland Winterhawks play their first home game of the 2018-19 Western Hockey League season on Saturday. But it will be awhile before we — or the coaching staff — know whether this be a team in transition season or in contention. What will happen when exciting rookies are thrust into significant roles? And, will Portland have enough experience and firepower to be make a run in a strong U.S. Division? 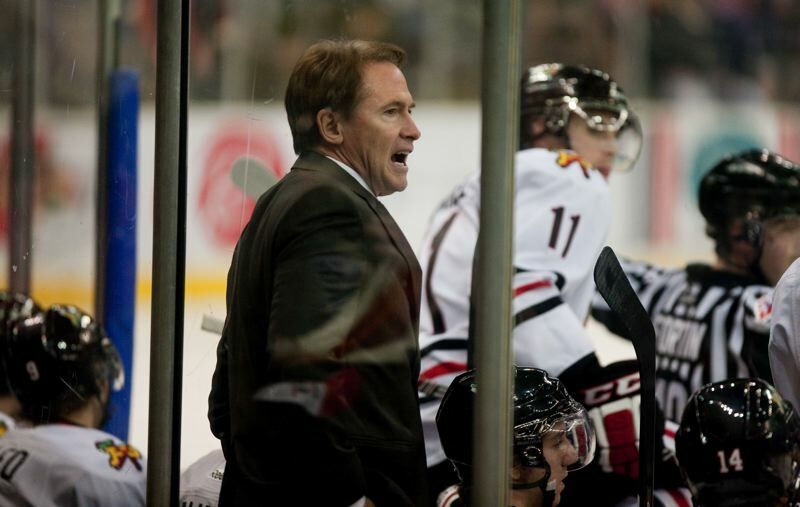 Winterhawks VP/GM/coach Mike Johnston views the early schedule as the time to learn about his team, and assess its potential and shortcomings. The return of center Cody Glass for a fourth season in Portland for his 19-year-old season is one reason for the Hawks and their fans to dream big. Glass (6-2, 185) put up 102 points (37 goals, 65 assists) in 64 regular-season games last season. In three full seasons with Portland, Glass has 223 points in 201 games, and 25 points in 27 playoff games. The first draft pick in Vegas Golden Knights history, Glass was assigned to Portland this week after participating in Vegas training camp and appearing in two NHL preseason games. He had two assists in the preseason opener, missed three games with an undisclosed minor injury, and played in Monday's preseason loss to Colorado. Portland received a surprise when 20-year-old Joachim Blichfeld was returned to Portland by the San Jose Sharks. Because the Sharks have depth at forward for both their NHL and American Hockey League teams, Portland became the best option for the Denmark native. "It's really good to have him back," Johnston says. "He's a goal scorer." The Sharks want Blichfeld, who put up 52 goals and 62 assists over his first two seasons with Portland, to develop his leg strength in preparation for pro hockey. Despite missing Portland's preseason, Blichfeld delivered the first goal of the season in an opening loss at Seattle and added an assist in the second-game loss at Everett. Players with junior hockey eligibility remaining who are expected to begin playing pro hockey instead of returning to the Hawks are Skyler McKenzie, Kieffer Bellows, Henri Jokiharju and Dennis Cholowski. Jokiharju, 19, is expected open the season with the NHL's Chicago Blackhawks. Unlike Glass, who must return to junior hockey if he does not make the Golden Knights, the Finnish defender could have the option to play professionally in Europe if he does not stick with Chicago. Bellows, 20, will open with the Islanders' AHL team in Bridgeport, Connecticut. McKenzie, 20, scored twice in his preseason debut with the Winnipeg Jets but seems ticketed for Manitoba in the AHL. Cholowski, 20, is having a strong training camp in Detroit and is expected to play in the AHL if he doesn't make the Red Wings' roster. The return of Blichfeld, while welcome, meant the Hawks had to part with two players to meet league maximums of three 20-year-olds and of two import players. Conor MacEachern, a 20-year-old forward who played 160 regular-season games over three seasons with the Winterhawks, cleared WHL waivers this week and can join another club. Dean Schwenninger, the 17-year-old Swiss center drafterd in the first-round of May's import draft, has been released. Anticipating the departure of both Blichfeld and Jokiharju, the Winterhawks picked Schwenninger and 18-year-old Czech winger Michal Kvasnica in the import draft. Kvasnica played in the first two road games. The other 20-year-olds on the roster are defensemen Brendan De Jong and Jared Freadrich. Portland is set at goalie, where 19-year-old Shane Farkas is the starter after a solid year as Cole Kehler's backup. Behind Farkas is 16-year-old Dante Giannuzzi, who won a training camp battle with 17-year-old Evan Fradette. Fradette has joined the St. Albert Raiders of the Alberta Midget Hockey League. The play of 19-year-olds is always significant in junior hockey. Portland appears to be in good shape in that regard. Forwards born in 1999 are Glass, Jake Gricius, Lane Gilliss, Ryan Hughes and Lukus McKenzie. Hughes is expected to miss a few more weeks after offseason ankle surgery, but is skating. Defenseman Matthew Quigley also is in his 19-year-old season. Production from the 19-year-old forwards and from second-year forwards Reece Newkirk, Mason Mannek and Ty Kolle will help define the Hawks' season. But the early buzz figures to surround an exciting group of rookie forwards. Seth Jarvis, 16, scored twice in the season opener. Jaydon Dureau, 17, got his first WHL goal in the loss at Everett. The coaches are high on 16-year-old forwards Cross Hanas and Robbie Fromm-Delorme. Haydn Delorme and Kvasnica are 18-year-old rookie forwards. De Jong (a Carolina Hurricanes prospect in his fifth season with Portland) and Freadrich (a fourth-year WHL player acquired in an offseason trade with Victoria) provide experience as two of the team's three 20-year-olds. Second-year defensemen John Ludvig, 18, and Clay Hanus, 17, figure to have larger roles. And rookies Nick Cicek, 18, and Kade Nolan and Nick Perna, both 17, will look to establish themselves. 1. Schedule trimmed: The regular-season schedule has been trimmed by four games to 68. The first of 34 home games is 6 p.m. Saturday at Moda Center. 2. Coaching staff: WHL all-time coaching wins leader Don Hay, who last season passed Portland's Ken Hodge, joined the Hawks as an assistant coach. He replaces another accomplished coach, Danny Flynn, who took a job as a scout for the Columbus Blue Jackets. Associate coach Kyle Gustafson, promoted to assistant GM in the offseason, begins his 14th season on the coaching staff. 3. Where are they? : Last season's overage players are starting their pro hockey careers. After five seasons in Portland, defenseman Keoni Texeira is with the ECHL's Wichita Thunder. … Goalie Cole Kehler has been sent to the AHL's Ontario Reign by the L.A. Kings. … Forward Alex Overhardt is at training camp with the AHL's Milwaukee Admirals.